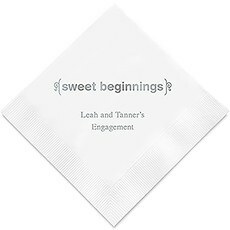 Customize your bridal shower party decorations right down to the pretty paper napkins. 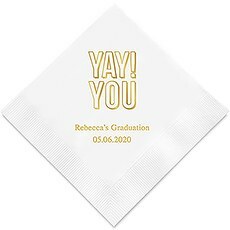 For a memorable bridal shower, infuse the special event with your unique personality! 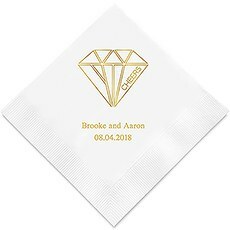 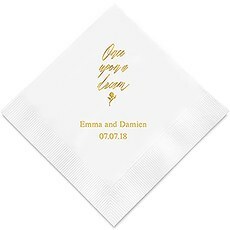 Browse our personalized bridal shower napkins with high-quality foil imprints in a wide selection of designs. 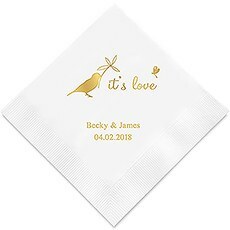 Whether you prefer sweet and sentimental or silly and whimsical, we have the ideal logo that will convey your joy to family and friends. 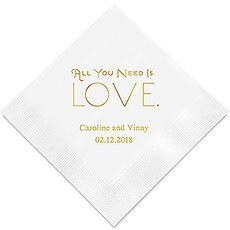 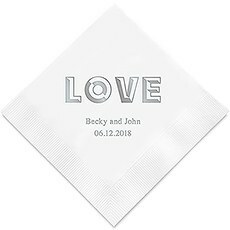 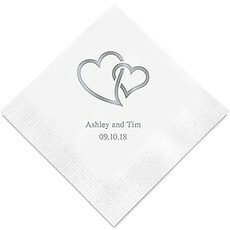 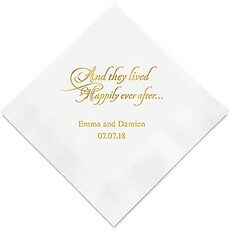 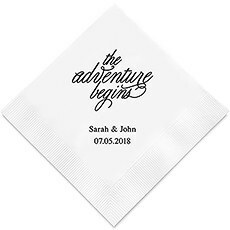 Engraved bridal shower napkins, in addition to being practical, are also great mementos for your guests to keep in a scrapbook along with their photographs.Choose from wedding shower napkins with romantic messages like True Love, Me & You, joined hearts or Love Gives Us a Fairytale. 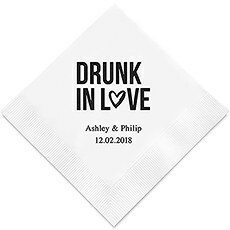 There are also many options for those who enjoy humor and a touch of whimsy, from Sip Sip Hooray and Drunk in Love to The Adventure Begins and Fling Before the Ring. 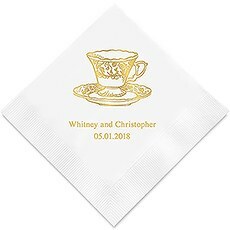 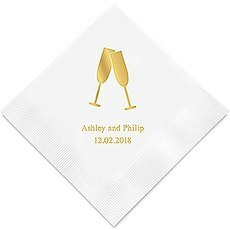 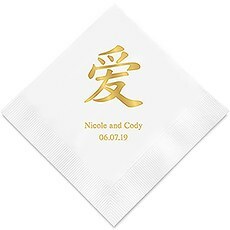 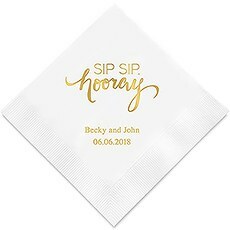 These designs can also be used for an engagement party, and certain styles are great for celebrating birthdays as well.These attractive logos are foil imprinted onto premium bridal shower cocktail napkins, luncheon napkins and rectangular fold dinner napkins. 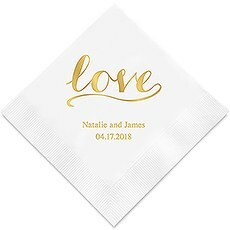 Select the napkin color and imprint foil color for the best contrast of colors and most complementary shades to match your bridal shower decor. 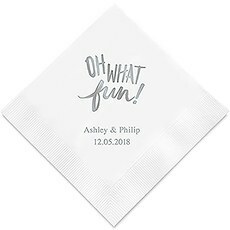 Is the gathering going to be a more traditional affair, or are you planning something different for a future bride with modern style or quirkier tastes? The Knot Shop has both classic and contemporary accessories and decor for your wedding and bridal shower, and monogramed napkins are just the beginning!At The Knot Shop, we've been helping couples create exquisite weddings for more than 34 years. 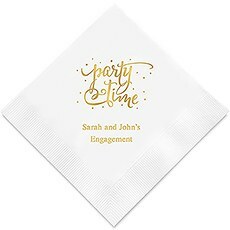 Our hand-picked products reflect the latest trends in wedding fashion and high-quality, affordable wedding accessories. 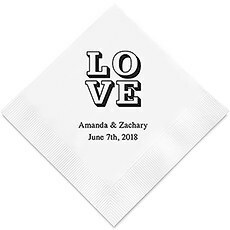 We're proud of our commitment to our customers and our outstanding customer service.